Thanks undef. That helped to the point where now I have the DedimaniaRecordsWidget, LocalRecordsWidget and LiveRankingsWidget appear simultaneously. The problem now is that when I log off the server and log back on, none of those widgets appear. I'll need to press F7 for them to appear every time I log onto the server. at the same time, then restarting xaseco2, pressing F7, enabling those 3 lines again then restarting xaseco2 again. The widgets still don't appear when I log onto the server. Jerome wrote: Thanks undef. That helped to the point where now I have the DedimaniaRecordsWidget, LocalRecordsWidget and LiveRankingsWidget appear simultaneously. The state of the Widgets isn't stored into the database on pressing F7 (temporary change), only "/eyepiece show" or "/eyepiece hide" store the state (permanent change). Ah silly me, it's all good now, thank you. Is it possible for the WinningPayout to be limited to the Donated amount. So players can not win more as they have donated. Maybe with a Variable setting for limit 80% or 90% percent of donated amount. I have already been looking trough the php but I can't seem to find where the total Donated amount is stored so i could compare the TotalWinning to TotalDonated. Shrike wrote: Is it possible for the WinningPayout to be limited to the Donated amount. So players can not win more as they have donated. Maybe with a Variable setting for limit 80% or 90% percent of donated amount. Shrike wrote: I have already been looking trough the php but I can't seem to find where the total Donated amount is stored so i could compare the TotalWinning to TotalDonated. The donated amount is stored in the database table`players_extra` at `Donations`. With this value you can only see how much the player has donated from the first visit. I keep getting this message in my logs (spammed), everything works great but its kind of annoying. Started when i put nice mode forced to true, error disappears if i put it to false again (but i want it forced). coshank wrote: I keep getting this message in my logs (spammed), everything works great but its kind of annoying. Started when i put nice mode forced to true, error disappears if i put it to false again (but i want it forced). Fixed for the next release, thanks! I have a problem with Records-Eyepiece. I don't have access to php.ini. [...] add -d memory_limit=-1 as parameter after the PHP executable. I have this problem with the plugin. As you can see I have the plugin in the correct folder. Still I get this message? I have no clue on what to do, any suggestions? 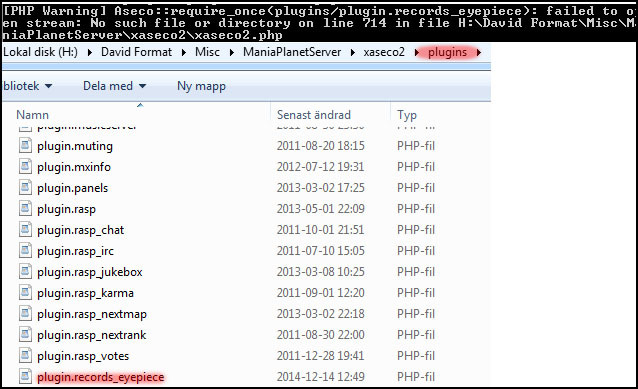 Read the warning more carefully: it states exactly which file it attempts to open, and that one is present in the plugins directory with .php extension. This is why in Windows Explorer, it's better to disable Hide Known Extensions. is it possible to identify demo players? if it is, it would be great to get an update for not paying out demo players on <winning_payout>. «从々.»«ॐ²³» wrote: is it possible to identify demo players? Currently there is no method/option to identify that.